* Also available as an eBook! 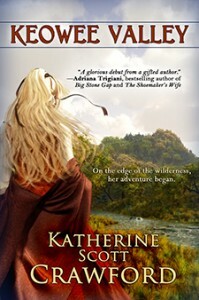 In the Spring of 1768, 25 year-old Quincy MacFadden–unmarried, bookish, and happy with it–abandons her civilized life in Charlestown, South Carolina for the wild Appalachian frontier. She’s determined to do two things: save her beloved cousin from certain death at the hands of the Shawnee Indians, and build a settlement of her own. But Quinn is plagued by visions of the future, and can see war building on the horizon. What she never expects is Jackson Wolf: half-Cherokee, half-Irish, he’s an Indian translator for the British Army caught between two very different worlds. Together they journey across the mountains and into the very heart of the Cherokee country, encountering wily trappers, desperate settlers, warring Indians, British soldiers, and a contested backcountry on the brink of changing forever. When Jack is ordered to negotiate for Indian loyalty in the Revolution to come, the pair must decide: obey the Crown, or commit treason …. Your local Indie book store!